NEW!!! Downloadable Financial Tracking Spreadsheets for Full-timers - Click Here For Details! Below you will find our personal budget for 2011. It will look quite different than the budgets you have seen in prior years. At the end of 2010, I developed some new spreadsheets (see scrolling link above) that provide more detail and automatic calculations, so the format has changed. However, like the last couple of budgets, we used our prior years of history on the road to establish this budget. We tried to anticipate some increases in certain categories, and we are not expecting to workamp in 2011, so the total expenses will be higher than the last few years when we workamped. 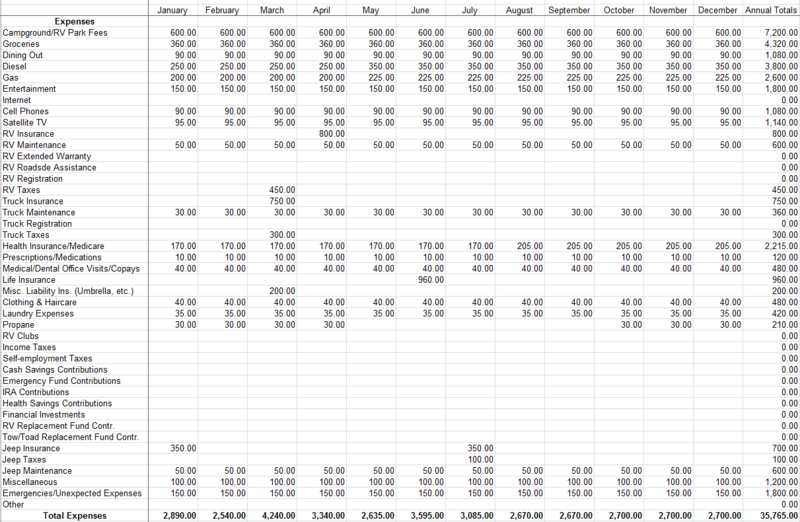 As you can see, we have budgeted $35,765 for the year, just slightly under 2010's $36,224. However, whereas we had consistently been coming in at an average of $28,000 for Basic Living Expenses in the years we workamped four months or more, we've had to adjust the numbers for 2011 since we have no plans to workamp and will be concentrating on this website. In our expense recording and tracking, we have analyzed our expenses when workamping and when not workamping. When not workamping and traveling, our monthly expenses average out to annual expenses of about $33,400. So that was a good starting point. But with plans to travel in the northeastern U.S. this summer where overnight fees are higher, we have increased our Campground/RV Park Fees budget from $450 per month to $600 per month. It looks like we should make that at least $900 per month for the summer, but we are going to try to figure out how to keep total costs lower. And if we can't manage that, we'll cut expenses in other areas. In the end, we came up with that budget of $35,765 for 2011 which should cover our Basic Living Expenses and includes another $1,800 for emergencies and/or unexpected one-time expenses. NOTE: You will notice that the Internet category includes all zeroes. We include our internet costs in our business expenses for RV-Dreams.com. We just wanted you to be aware. For most full-timers, add between $50 - $80 per month for internet.